Tamago is the Japanese name for a sweet egg omelet. This omelet can be used in maki and on nigiri sushi. The only problem is that the tamago is so good that once you try some, there might not be any left to make sushi with! This isn’t exactly a traditional recipe. Instead, this is how my mom used to always make it, so it might be a little different than what you find in sushi restaurants. Crack the eggs into a bowl. 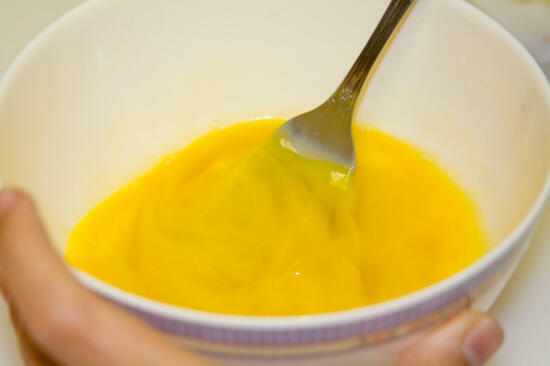 Using a whisk or a fork, whisk the eggs until smooth. Stir in the sugar and shoyu, stirring until thoroughly mixed in. Heat a frying pan at medium heat. Melt about 1/2 tbsp butter in the pan, spreading it so the bottom of the pan is completely covered. 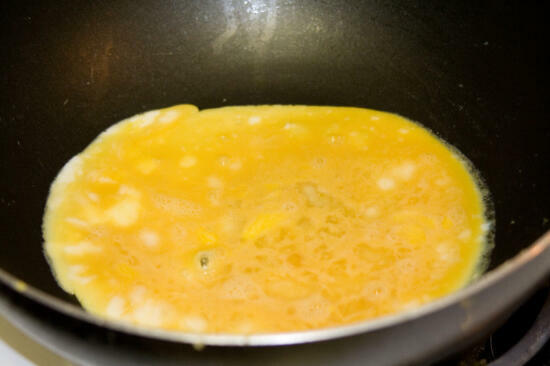 Pour the egg mix into the pan. When the egg looks opaque and you can get a spatula under it without tearing the omelet, flip the omelet. When the omelet is coked through (you can lift the omelet with the spatula to check underneath), remove the omelet from the pan. Slice into thin strips. The width of these strips depends on what you are using the tamago for – for tamago nigiri, cut them into 1.5″ x 2.5″ strips, to use in maki cut into 1 cm strips. i don’t think that’s how you make tamago. Russell – Oops sorry, I was in a rush and accidentally spelled it wrong. 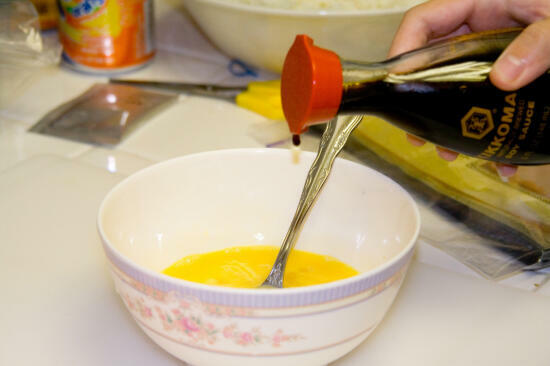 hien – There are many different versions of tamago recipes. This recipe is one of the many that I have found, using ingredients that most people are able to find easily. I don’t have the tools to cook it exactly how it is supposed to be made (and most people who read this probably don’t either), so this is the easiest way for the average person to make tamago. I’m eating the Tamago right now. Very quick and easy and yummy! I had bought some Mirin the other day so I added about a teaspoon of that. Can’t wait to make it for maki sushi. Thankyou for the recipe. I really love this recipe for tamago. 🙂 I’m glad you like it! I agree… it’s really yummy! hi, i was just looking for an easy tamago recipe and i found your blog. i can’t wait to try your recipe. thanks for making it so easy, with the photos…. I tend to have a sushi party at least 1-2 times a year, having our gaming friends over to make their own rolls…we have a couple of local asian food stores, and one at least has frozen tamago bricks (that’s the only way I can explain it), though I’ve never tried it, and I always prefer to make everything myself. 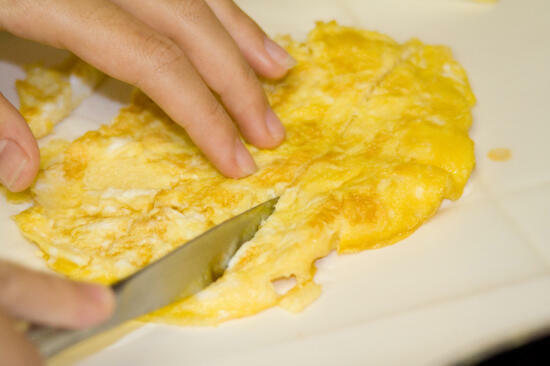 As of yet, I’ve never attempted the tamago omelette before, but I’ve been really hungry for it lately. I just happened to run across your blog via my Google search and found your oh-so-awesome recipe! 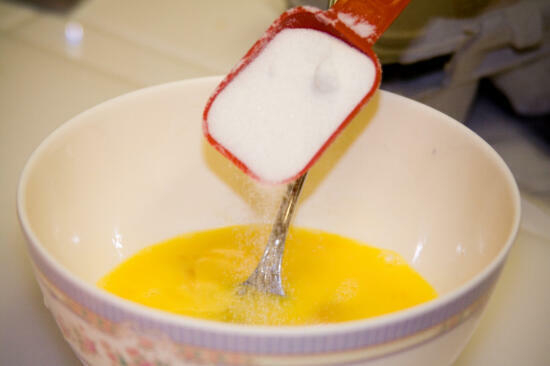 I’ll probably try it tomorrow to curb my craving – really looking forward to it, considering the “square pan, pour a little, move that to one end, pour some more, fold, repeat” always daunted me a bit…thanks a million for posting this recipe! A bit of a western thing, I know, but have you ever tried it on its own with a small dollop of whipped cream? Susan – That sounds like fun! If I can ever find a square pan, I am going to try to find a way to make the traditional way of making tamago a little easier for everyone to try (it intimidates me too! ), but for now this one works well for me! well i should’t say the method is wrong, but its quite gud and easy for the beginer. As for the real tamago, only professional chef can do it and thats how they judge whether the resttaurant is serving gud japenese fud. well i hav heard that ppl walk out of the restaurant if they find the tamago is bad. 🙂 This recipe is definitely aimed for beginners who like the taste but don’t want to go to the trouble to do it *correctly*! I’ve made tamago the “move and roll to one side” method (in a round pan, no less) and that’s lovely, but I wanted to THANK YOU for letting me see that YES, you can make it this way (and cut it into strips). The flavor is still just as delicious without all the extra work. As for “Chef Yitaro” – relax. And don’t substitute “u” for “you”. It makes you lose credibility. Yitaro – I realize that… as I said before, I posted this recipe in order to make it more accessible for non-chefs. Many people love the taste of tamago, but don’t want to go to the trouble of trying to make it the correct (but complicated) way or trying to go find not so common ingredients. Scooterdeb – Thanks. 🙂 I’m glad some people understand that not everyone wants to go through the trouble of doing things the *right* way at home. Thank you so much for posting this, it tastes really good! I had sweet egg for the first time just a week or two ago at a restaurant and IÃ¢â‚¬â„¢ve been wanting to make it ever since but all the recipes I found call for hard to find ingredients. 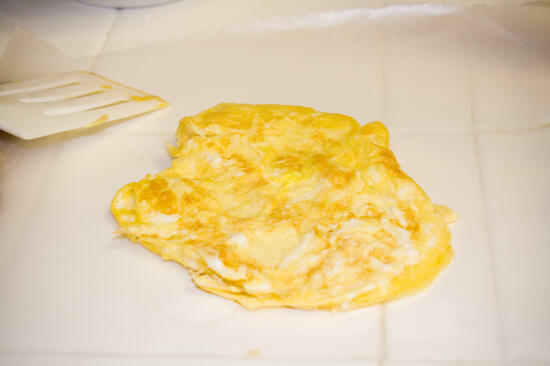 Oh, and whenever I try to flip the omelet, it gets all wrinkly. Am I not letting it cook long enough or am I just bad at using spatulas? Yitaro- and I may only be 16, but even I know that what you said was very rude! Just because you have an important job doesnÃ¢â‚¬â„¢t give you license to stop being courteous to others! Plus your typing skills make you sound like a second grader. yaay!.. thanks s0o beary much for posting this! I’ve been craving for tamag0 for s0me time n0w… T___T” Thanks t0 y0u im gonna try making one!.. Thanks for the variation! I am going to try this recipe but still roll it the traditional way! Domo Arigato! You’re so right when you say that once you tried tamago, there’s no leftover for sushi/nigiri !!! Yitaro, your spelling and grammar are an insult to the English language. For someone whose cooking techniques are supposedly so refined, you sure spend a lot of time on recipe blogs being a pompous jackass. Allison, thanks for posting an easy and accessible recipe. Even I can make this one! Nolwenn – It sure is delicious! Hi hi! I just wanted to say I tried your recipe and loved it. The egg tastes so good and sweet! Thank you for posting this recipe. I’m not usually able to spend a lot of time cooking. This was quick, easy, and great tasting. Thank you again. I found this recipe googling tamago and made it last night. It came out perfectly and I was overjoyed. I had found the more complicated recipes online as well, but I don’t have the skills or the right cooking utensils, so I was deterred from making it myself until I read your recipe. Your recipe was extremely easy to make and tasted very good. I slice it lengthwise and put it in my sushi roll along with avocado and maple-glazed tofu. It was awesome! Thank you for this recipe, I’m so happy I found an easy, undaunting way to make it myself! I’m so glad you liked it! 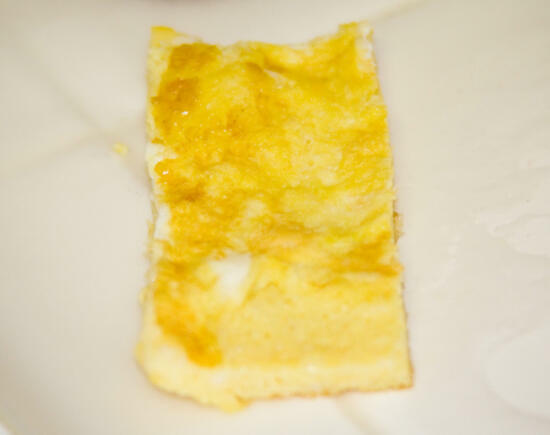 This was exactly my reason for posting this recipe – I wanted to provide an easy, non-scary way to make tamago. The roll you made sounds delicious! i’m sure this taste good, but this is not dashimaki tamago. no offense, but i agree with Yitaro. the texture and ingredients are wrong. what’s the difference between meatloaf and hamburger patties? there are lots of similarities, but they’re not the same. *sigh* Like I’ve said many times in both the actual post and in the comments, I know. This is not meant to be real, traditional tamago. 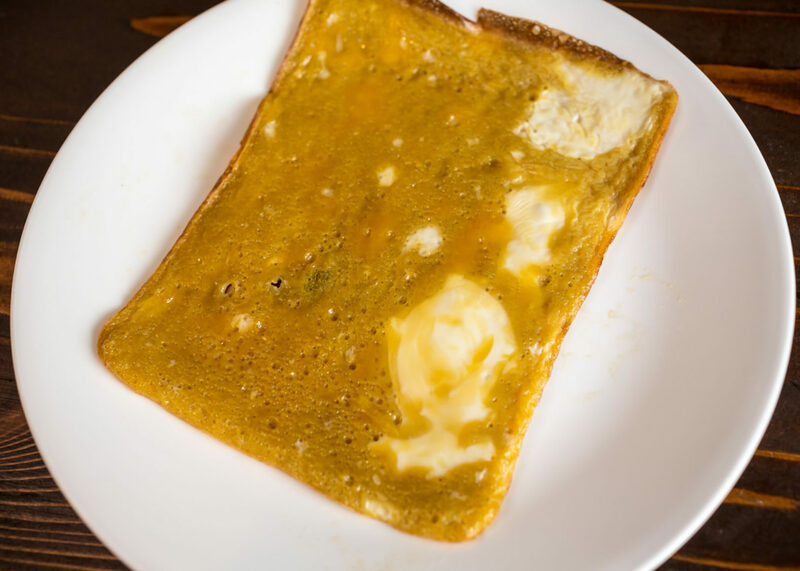 Instead, this is meant to be a very easy, non-scary way to make tamago for people who want to make it at home and might not have access to the more traditional, exotic ingredients. You will probably have to end up explaining that another 100 times. I get it, because I have taken the time to make real tamago and yes, it is an art–but that doesn’t make this easy hybrid bastardization any less delicious. Call it neo-pseudo-tamago and all will be well. And thanks for the recipe. Now to explain to Cosby the difference between chocolate pudding and chocolate mousse. Feh! Yes, I realize that *real* tamago is an art, and now that I have a pan appropriate for it I intend to make some… soon… I promise! And then I’ll post it here, and all the people freaking out about my good-for-those-at-home-without-lots-of-time-or-access-to-traditional-ingredients fake tamago recipe will be happy. I hope. I know its not “real” tamago, but I enjoyed it! I made mine even less “real” as I used egg whites, sugar substitute and a dash of chinese five spice. However, I wanted to thank you for such a user-friendly introductory recipe! Michele – As long as it tastes good, then I don’t have a problem with it. 🙂 You’re welcome! It looks easy to make and tasty too.. Ill try this recipe. Perfect for breakfast. This one really looks interesting. You have a great collection of recipes that is making my stomach growl! I can’t wait to try this one out. Hi , I’m a japanese expat . and i loved your recipe. i was rushing out a bento box the other day and i decided to make this instead of the other since i was running out of time, and my kid said it tasted delicious. Thanks for the wonderful recipe. The other ones I had found called for dashi stock which is not carried by the local asian market. This was an easy alternative to having to wait while i have dashi granules shipped to me. Even my picky 7 yr old ate this!!! I don’t care what the others say about this not being a proper recipe, it was excellent!! Thanks for making sushi a less daunting task overall with this site as well. You inspired me to try making my own after trying a few pieces at a local asian buffet that also had a sushi buffet. Ok so all the talk of real Tamago vs. this recipe made me curious. I found the harder to find ingrediants that were in my recipes that I had found prior to this one. My sister-in-law had dashi granuals and I found mirin at the local asian market,(got their last bottle til thursday!!). I made rolled tamago in a round pan and it did not taste near as good as the recipe presented. Given the dashi was fish broth, it was what she had. This was more savory than sweet and not as light. My vote goes to the recipe presented here!!! It’s easy to make and it’s really good:) Thanks for the recipe. This tamago recipe is perfect! The proportions (egg to shoyu to sugar) worked a lot better than other tamago recipes I’ve tried. Yummy! thank you for this recipe, i found another recipe but i don’t have the materials for it. good thing i found this 😀 i’m trying to do a tamago right now. Good recipe, very simple and tasty, tastes like the real thing but very easy! All the other recipes are (as you said) a bit to complicated for such a simple thing. Especially for westerners that don’t have a japanese dedicated kitchen. This works! Kids needed a “quick fix” this morning and your recipe got them moving. Thanks! Hi Allison! I used this recipe as part of this month’s Daring Cooks sushi challenge. Tamago is one of our very favorites (we always save it for “dessert”/eat it last when we eat sushi out), and I didn’t think I’d be able to master the traditional technique at home. Thanks so much for the shortcut version, I was really glad to be able to include it in our at-home sushi meal. Cheers! Just found the site today while googling Tamago recipe. Recently I’ve added tamago to my regular order at the few sushi bars in my area and I love it, so much I had to try to make it myself. This recipe turned out great for me. I ended up doubling the recipe and using a squarish electric skillet. Using it, I was able to roll up the tamago like you would traditionally see, it just wasn’t as uniform. Still great recipe, and I’ve looked around on the rest of this site, great stuff, I’ll be using this as a reference as I proceed with more of my own sushi related endeavors. wow looks good, I’m going to try this tonight. Can this be refrigerated then carried around for several hours in a box? Thank you for this, I keep my own hens and i am constantly searching for brand new methods to prepare the eggs. I just made this as a trial run for a snack tonight (making sushi in a couple of days for supper) and it worked very well! I used to have mirin from the last time I made sushi, but that was YEARS ago and I just finally threw it out recently. And now here I go, trying it again 😉 So I didn’t want to buy mirin and was wondering if I could substitute sugar, and sure enough. Sure, maybe it’s not authentic, but good enough for me! I wasn’t able to flip it (too slippery!) but what ended up happening naturally was it folded one third over… so I folded the other third over and presto, it came out sort of like it was supposed to in the first place 😉 I only did a half recipe and had a whoopsie with the soy sauce and so had probably twice as much as I should have for the amount of egg… still yummy. This recipe is a godsend. I’m 12 weeks pregnant and haven’t been able to eat meat for almost five weeks, and eggs for longer, which is bad since eggs have high amounts of choline which is vital for fetal brain development. I knew today I wouldn’t be able to eat western style eggs, but thought if I could get some sweet Japanese style eggs I’d be okay. And it worked! Your recipe is easy, delicious, and a reasonable facsimile of “real” tamago, enough so that I’m sitting here eating a plate as I type, and I think it’s going to stay down. Thank you, thank you, thank you. Ouh… nice recipe and nice photo shoot. I’ll try this recipe soon. Hmmm..yummy! This is not how you make Tamago. This is more like an American omelette. Ms. Collector – It is! Great for breakfast, I recommend it. Atave – Thanks! I’m glad you like it! Emma – Thank you! Exactly. Most Westerners won’t have the proper pan for tamago, access to the more exotic ingredients, or the patience to make true tamago. Ila – Fantastic! I’m happy to hear it turned out well for you. Crock – Wonderful, I hope your family enjoyed it! Jenn – That’s very cool. Tim – Great, how did you like it? Mr. Tutorials – Thank you! Hope you like it! wow – Well, yes. That’s been addressed numerous times in the comments and the post. Do you have a better recipe you’d like to recommend? I’ve made tamogo using your recipe and it’s heavenly. Thanks a lot for the step by step instructions. 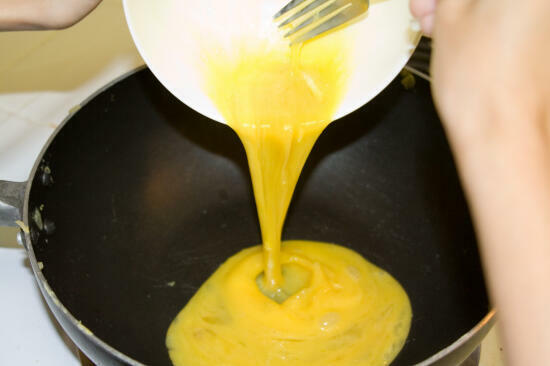 Pingback: How To Make Tamago « ???????? I absolutely love tamago nigiri but even without the seaweed belt 🙂 right now I’ve had my bottom teeth removed from dental complications and tamago nigiri is about the right texture for me to be able to gum to eat. Thank you for providing a simple recipe for us uncomplicated people. If you don’t like the recipe here, no one is making you make it! To those prudes who can’t get off their ivory chopsticks, I say poo on you. An easy recipe was asked for and was given. I don’t see you posting your difficult recipe so others can learn the other way! Just my $.02… while you didn’t make “real tamago”, you inadvertently made the style of omelet that goes into gimbap, a Korean sort of maki. Check it out Wikipedia. Thought you might enjoy that bit of trivia both as a compliment and possibly as another dish to try. PS. Just cause you and a few commentors mentioned you like mirin, but hardly use it so you’re reluctant to buy it, if you water down white or apple cider vinegar, you can approximate the acidity. it’s not tamago recipe…or it’s a very weird tamago recipe. Traditional tamago is made of layers and it’s rectangle. You can do it without special frying pan. I did try your recipe…I’m pro sushi chef. Didn’t like it. Sorry. This was really good! I think I’m part of your intended audience. I live in a small city with very little access to Asian ingredients. I made this recipe with a couple of small alterations. I used one tsp. of sugar and instead of using shoyu, I used tamari. It turned out great! My boyfriend is already asking for seconds!